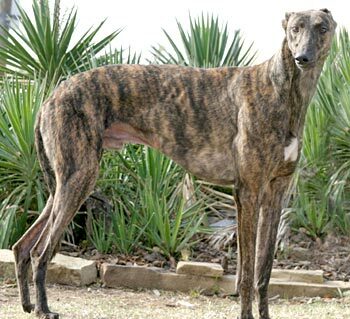 Egor, aka Serena's Egor, is a 4½-year old dark brindle male born April 24, 2007. His sire is Lonesome Cry, making his grand sire the famous Gable Dodge, and his dam is Smart Serena, making his grand sire the famous Molotov. This makes Egor half sibling to Serena and Wizard. Egor has no races on his record. 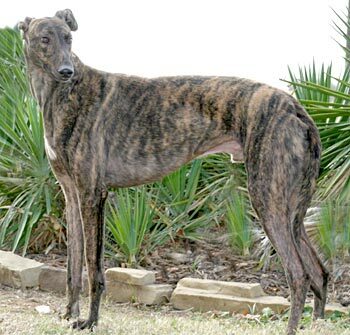 He is a smaller boy with very striking brindle markings. 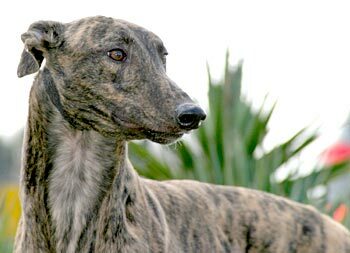 Egor was adopted and in a home for over two years; however changes in the family structure dictated his return to GALT. Egor was diagnosed and successfully treated for intestinal cancer while in his adoptive home - he has been evaluated by an oncologist, and his prognosis is quite good. Upon his return to GALT, Egor accidently cut his foot while playing with his foster brother, and he required surgery to repair the slice in his front right foot, but his foot is all healed now! Egor is not cat or small animal tolerant.